If you’ve been following our social media feeds over the last few days you will be aware that Broken Frontier were at the Laydeez do Comics Festival over the past weekend. On Sunday we took the opportunity to look through this year’s Laydeez Prize comics entries, spoke about Broken Frontier’s work with a special presentation, and generally enjoyed a fantastic day of comics community. This year’s Laydeez do Comics Prize for a graphic-novel-in-progress by a female-identifying UK-based creator was won by Niki Bañados for Shivers in London. 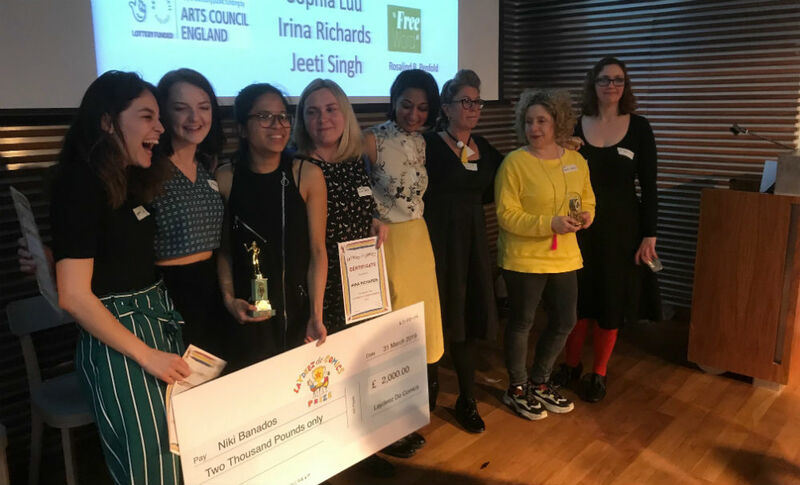 You can see her above with her giant winning cheque (left to right shortlisted artists Sophia Luu, Maria Flower, Niki Bañados, Irina Richards and Jeeti Singh, and Laydeez team members Nicola Streeten, Sarah Lightman and Wallis Eates). Congratulations to Niki and our thanks, as ever, to our friends at Laydeez for the incredible work they do. For more on the work of Niki Bañados follow her on Instagram here and on Twitter here.